DynaMEK Group Ltd. - Services DynaMEK Group Ltd.
DynaMEK Group Ltd. can help support your existing fleet of Tunnel Boring Machines (TBM) with design services for refurbishments and replacement of major systems and components. We can help source replacements for obsolete components and integrate new and older systems. If you are contemplating a new or used TBM purchase, we can offer consultation to assist with specifications or inspections, act as technical representatives, and support factory and site validation functions. We have extensive experience in Project Management, particularly with the design, manufacture, commissioning and operation of Tunnel Boring Machines and can support you in these crucial phases of any tunnelling project. Additionally, if you have encountered issues during a tunnelling project we can support you with consultation for on-site repair, troubleshooting, feasibility studies, and technical support for dispute resolution or even arbitration. DynaMEK Group Ltd. can prepare specifications for new TBMs, act as a technical representative during the TBM procurement process, or support validation activities as part of a factory or site acceptance test. We can prepare TBM assembly method statements and launch drawing documentation. We can also prepare recommended maintenance schedules for the equipment. If you need support to generate a TBM refurbishment schedule or project plan, let DynaMEK Group Ltd. assist you with your Project Management needs. We have years of experience in the various stages of TBM projects and can support you whether you are a Tunnelling contractor purchasing or refurbishing your own TBM or a Project Owner overseeing the status of a TBM build. 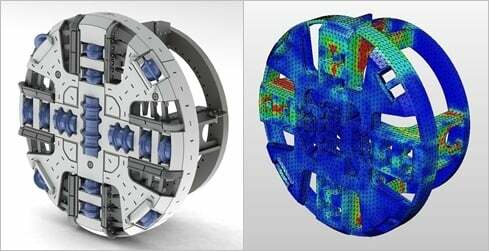 DynaMEK Group Ltd. can design new major components for your existing TBM, or prepare detailed designs to undertake a repair plan to keep your TBM working for you. This may include upgrading your TBM for use in a different geology, adding new features or simply replacing obsolete equipment.